Have you always wanted to learn how to fly a helicopter? Here is your opportunity with this introductory lesson from the Whitsundays Airport in Airlie Beach. Live your dreams today! Experience the thrill of piloting a helicopter! Enjoy an adventure packed 1 hour experience where our professional flight instructor will guide you through a flight briefing and 20 minutes of actual flight time, where you actually get to take the controls for yourself! Your experience begins with a pre-flight briefing where your instructor will explain how the helicopter flies, and how the flight controls work. After the briefing, you will be taken out to the helicopter, where your instructor will explain what the main components are, and strap you in for your lesson. Your instructor will talk you through the start-up procedure and take-off, and once airborne they will hand the controls over to you. Now you are flying the helicopter! They will guide you through some basic manoeuvres, before returning to the airport. Once back at the airport, they will talk you through the landing procedure. Once back on the ground, you will be given a debrief by the instructor on your performance and they will answer any questions that you have. 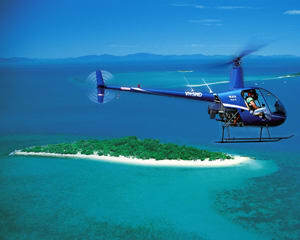 This flight experience departs from beautiful Airlie Beach in the Whitsundays. Would recommend to anyone interested in helicopters, it exceeded my expectations totally. Will remember forever. What an amazing experience!!!!! I have been disappointed by how some experiences have been alot of talk with no action. This was all action. Before I knew it I was flying the helicopter right from take off. Definitely the best experience I have done. Would recommend to everyone. On the day of the flight I was initially contacted and informed that the arranged start time would need to be pushed back by one hour which was not an issue to me (I was actually grateful to be informed). I still had to wait a further 40 minutes once arriving at the airport for the pilot to arrive. Apart from this, the experience was thoroughly enjoyable, something I will repeat in the future. An adrenalin fuelled experience which exceeded my expectations! Go and fly a helicopter in the whitsundays and hover over roos, rats and watch out for the crocs, not forgetting the rainforrest and the mountains, oh... and remember to hold on... be gentle and RELAX! The prompt service given by Adrenalin made this purchase extremely easy. The website is full of fantastic ideas and I will definitely be using this site again. The range of ideas/products is mind blowing. My partner was overwhelmed with his gift certificate and has used it already. The whole experience from start to finish was sensational.